If you are you looking for genuine Navajo rugs for sale, you have found them. With Nizhoni Ranch Gallery you get access to one of the world's largest selections of authentic Navajo rugs for sale available online today. Navajo weaving and Navajo blankets represent a Native American weaving tradition going back centuries. So look no further. You have found your definitive source for Navajo Rugs, the Nizhoni Ranch Gallery, Sonoita, Arizona. Click here to skip to the Navajo rugs for sale..
Steve Getzwiller's Nizhoni Ranch Gallery has been involved with Navajo Weaving for many decades. Steve is committed to the furthering and preservation of the Art of Navajo Weaving. He accomplishes this by collaborating with exclusive Master Navajo Weavers, who utilize authentic materials like Churro Wool prepared and woven using millenia old cultural traditions. Arguably the world's foremost authority on Navajo Weaving, Steve Getzwiller actively promotes the legacy of Navajo blanket weaving. Nizhoni Ranch Gallery is committed to offering you the largest possible variety of handmade Navajo rugs for sale! You can choose Navajo rugs in a number of sizes, from huge room-size rugs, to tiny rugs, perfect for use in entryways or as wall hangings. 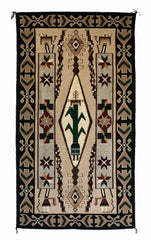 You now have access to Navajo rugs designed in a huge variety of regional Navajo weaving styles. Browse Bistie, Storm Pattern, Crystal, Chinle, Burntwater, Two Grey Hills, Teec Nos Pos, and many other Navajo regions and styles. Plus, you can get started without breaking the bank. 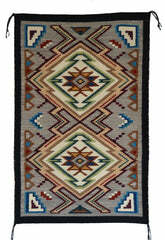 Navajo rugs for sale representing a broad spectrum of price points are available to you. Nizhoni Ranch Gallery has an entire selection of Navajo rugs, Navajo blankets, and other Navajo weaving priced under $500 dollars. In contrast, you can choose historic pieces and magnificent new custom Navajo designs that cost several thousand dollars! True Navajo Art masterpieces!! Many of the Navajo rugs for sale on our site, including many of the new pieces, have literally hung in museums. These are not merely Navajo rugs. These are works of textile art, to be collected and handed down accordingly. Whether the rug you buy at Nizhoni Ranch Gallery costs $400 dollars, $4,000 dollars, or $40,000 dollars, always remember that you are buying genuine authentic quality Navajo rug weaving in each one of these price ranges. Steve and Gail Getzwiller, and the rest of the Nizhoni Ranch Gallery team, work very closely with the Navajo artists who weave these rugs. Longstanding relationships, and direct dealings with the most talented Navajo weavers ensure you the best prices for the highest quality Navajo rugs available today!